No other art form, other than conversation, can give the satisfaction of spontaneous interaction - Stan Getz on jazz. Easter Sunday is set to take a bluesy twist this year thanks to swanky cocktail bar Quill, as it presents a special Bank Holiday edition of Sunday Jazz. The event will provide those looking to kick back and savour the Easter break with live jazz acts paired with the writing inspired cocktail creations that the King Street bar has fast become famous for since opening last year. From 6pm 'til late, guests can enjoy 2-4-1 cocktails, choosing from delights such as 'The Graduate', a zesty infusion of lemongrass gin, lemon barley water and thyme; 'Letters from Seville', a heady cocktail of Aperol, yuzu liqueur, blood orange, lemon and orange bitters topped with Prosecco and mint and 'The Hour Glass' with smooth rose, creamy caramel, gold and Prosecco. Quill's classic oak flooring, bookcases and wooden panelling will no doubt play the perfect back-drop to an evening of classic, chilled beats and weekend wind-down vibes. Whether you're looking for an evening of decadence or relaxing conversation, the bar is hoping to bring a touch of downtown New Orleans to the streets of Manchester. 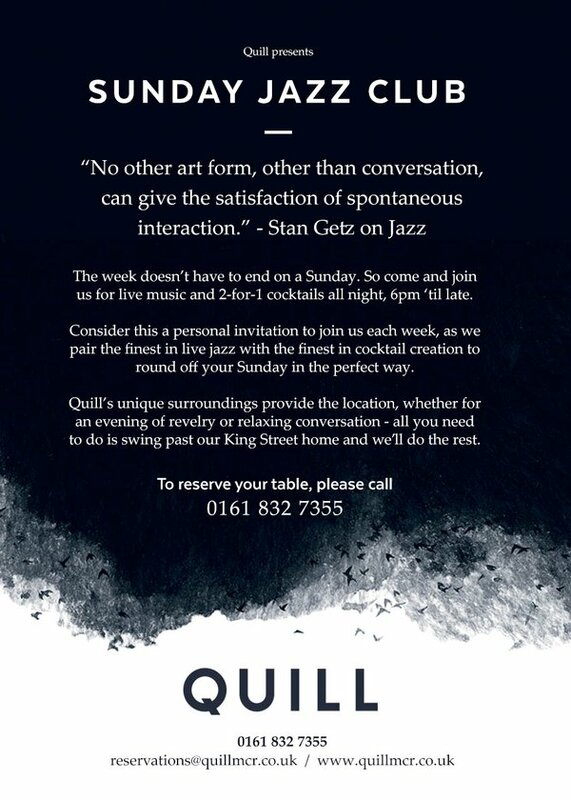 To reserve your table please call 0161 832 7355 or email reservations@quillmcr.co.uk.